The conference will be hosted close to the city center with plenty of choices for housing and easy access by public transport. Since the time of the conference conflicts with the summer term teaching period, which means that all lecture halls are busy, we have decided to go for the Sheraton hotel at Munich Arabella park. The Sheraton features a separate conference area with a common open space for breaks and posters and a number of halls for the main conference, the workshops, and demo sessions. The largest hall easily accommodate more than 250 attendees with individual tables. Four halls for 100+ people are available in parallel. The early hotel reservation deadline has now passed. Rooms may still be available at the conference rate. Please contact Kim Grabbe to check for availability. The venue is easily reached by subway (line U4) and situated in a nice neighborhood. The Westin hotel (for additional accommodation) is on the opposite side of the street and several other hotels are close by. A number of restaurants are in walking distance. The city center (Odeonsplatz, Karlsplatz) is within 10min by direct subway. The city of Munich is the capital of the State of Bavaria located in the South of Germany. With 1.4 million inhabitants (2.6 million in the urban region), Munich is the third largest city of Germany (after Berlin and Hamburg). Bavaria is one of the wealthier German states and Munich is a stable and prospering place with a positive economic and other trends. Bavaria and Munich strive for (and succeed in) attracting entrepreneurs, especially in the high-tech sector and emphasize digitization and mobility in the future as important themes. Munich is a safe place to visit (lower crime rate than other German cities) and, people enjoy a high quality of life with many quality restaurants, cafés and so on. 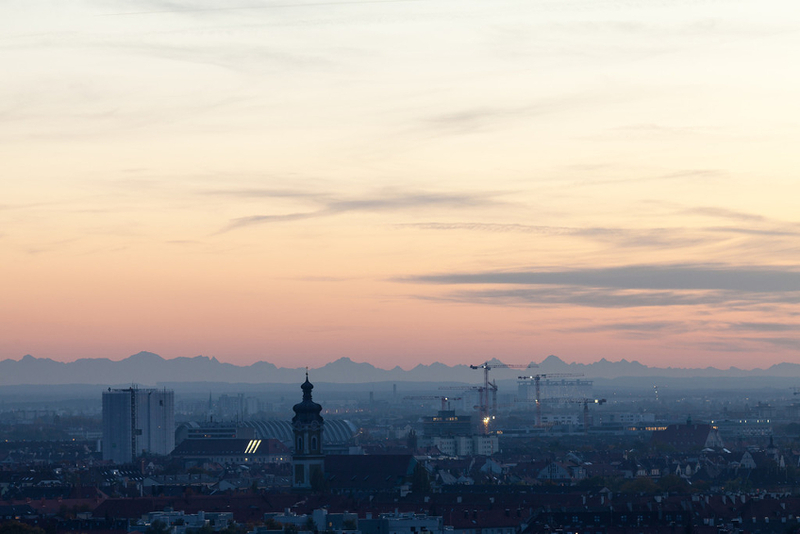 In this spirit, Munich is sometimes referred to as the “northernmost city of Italy”. The central city area is lively day and night and distances are short enough to allow moving around on foot or by one of the many means of public transportation (see below). The city is very international and the locals welcome visitors who come plentiful to see the city (not just during and for Oktoberfest). The city and state are also home to substantial industry related to mobile systems, including companies such as BMW, MAN, Audi (in Ingolstadt) from the automotive sector and Google, IBM, Nokia, Siemens, Rohde & Schwarz, Huawei, and a broad spectrum of SMEs related to mobile and networked systems and services. Munich features two universities, Technische Universität München (TUM) and Ludwigs-Maximilian-Universität München (LMU), both offering computer science and other schools related to MobiSys. Moreover, Munich hosts a University of Applied Sciences. This yields a substantial local student and researcher community in the field. Munich has a large international airport (MUC), which is the Lufthansa hub besides Frankfurt. MUC is serviced by essentially all major airlines (and airline alliances), features direct international flights to continents and otherwise usually connects via one hop to all destinations not directly reached. The airport services close to 41 million passengers in 2015. See http://www.munich-airport.de/en. The airport is located in the North of the city, connected via two suburban train lines to the city center (S1 and S8); a ride takes some 35-45 minutes and costs EUR 10.50. Taxis are also available but the fare from the airport to the city is some EUR 50-60. Depending on the time of day, taxis may be slower than the train. All major car rental companies can be found at the airport as well as downtown. Munich also features three train stations, Munich main station (Hauptbahnhof) and Pasing (to the West) as well as Munich East. They are frequent services to all major cities within Germany and to the neighboring countries, often on the German high-speed train ICE. Munich offers a wealth of local transportation options, including an extensive subway and suburban train system, many tram lines, and countless buses. All share the basic fairly simple tariff system that requires only one type of ticket for all of the above. The city also offer many bike lanes and rental bikes for individual transport. Finally, several car sharing services such as DriveNow or car2go are available for individual trips inside and around the city. 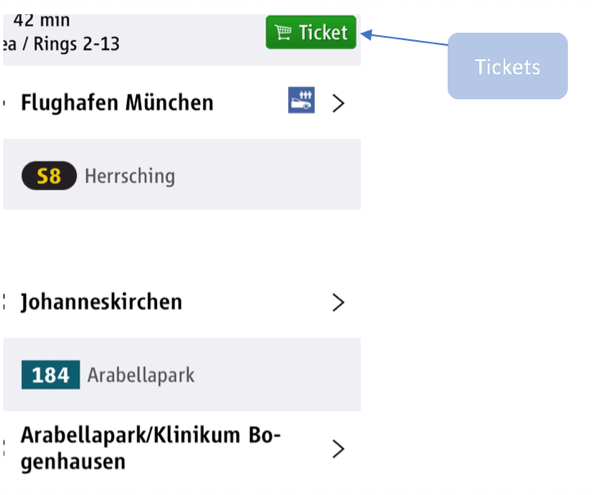 If you need to go to Arabellapark from Munich Airport: Take the suburban train line S8 towards Herrsching. At Johanneskirchen station change into the bus line 184 towards Arabellapark. Leave the bus at Arabellapark/Klinikum Bogenhausen station. If you need to go to Arabellapark from Munich Central Train Station (Hauptbahnhof): Take the underground train line U4 towards Arabellapark and leave at Arabellapark station. Download the “MVG Fahrinfo” app to your smartphone. You may also want to check out the online MVV Journey Planner. You are now able to plan your trips and train connections. Get a ticket: Open your “MVG Fahrinfo” app, enter and choose your desired connection. You can buy a ticket by clicking the “Ticket” icon on the upper right. Please take into account that tickets are only valid up until 4 hours after purchase. Follow the signs to the train station. Specifically, if you need to go to Arabellapark: Take the suburban train line S8 towards Herrsching. At Johanneskirchen station change into the bus line 184 towards Arabellapark. Leave the bus at Arabellapark/Klinikum Bogenhausen station. Taxis will be waiting in front of the airport terminal. every attendant with a “Conference“ or “MobiSys Full Pass“ registration will receive a 4-day conference ticket which will enable you to travel between all stations of Munich’s inner district. The inner district is marked white in the MVV network plan. For trips to the outer districts of Munich (marked red, yellow and green) or for visitors without a conference ticket you will have to buy additional tickets. Special offers, such as group tickets or tickets with 24h, 48h or 72h validity, can be found online: Tickets. Purchase your tickets via your “MVG Fahrinfo” app or at a special ticket counter which can be found at every station. your conference ticket will only be valid within Munich’s interior district. If you plan to return to the airport by using public transport, you will need to buy a ticket from Unterföhring station to Munich Airport. Enter the connection in your “MVG Fahrinfo” app. Now you can buy a ticket. Please be aware that your ticket is only valid up until 4 hours after purchase. TripAdvisor lists 395 hotels for Munich, many of which are centrally located. The conference hotel above offers the necessary capacity to host all attendees and we would work with ACM towards a room block allocation; other close-by options (walking distance) include the large Westin across the street, Leonardo Arabella Park hotel and hotel Rothof. But there are also inexpensive options available throughout the city, including many hostels, as well as apartments. The subway line U4 connects the venue to the city center in a 10min, opening up a wealth of alternatives from youth hostels to apartments. If you are interested to share a room with another participant, please send an email to woerndlin.tum.de, so we can exchange contact information for further coordination. To support moving between hotels and the conference venue for those not staying or in walking distance of the venue, we will issue a 4-day public transportation ticket for each participant. This ticket is valid for the subway, buses and trams in the inner city of Munich, but please note that it does not cover traveling to/from the MUC airport. We are working to provide Day Care to support participants traveling with children.